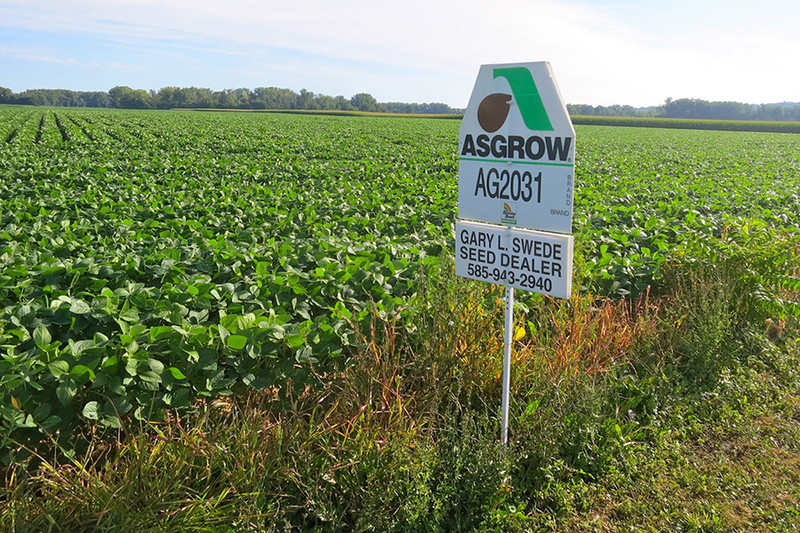 Asgrow, one of Monsanto’s many seed brands, advertised in a field of genetically modified soybeans in New York state. Changes in the seed landscape have alarmed some segments of the agricultural community. One of Asgrow’s seed-corn varieties is covered by 20 patents from Monsanto and 12 from DuPont, says sociologist Jack Kloppenburg, a founder of the Open Source Seed Initiative. As farmers bring in their crops in the northern hemisphere, we’re wondering: Who owns seeds and the genes that make them so productive? The approach deliberately echoes the open-source software movement. Linux, for example, allows, even encourages, users to improve the product — without seizing proprietary rights in it. 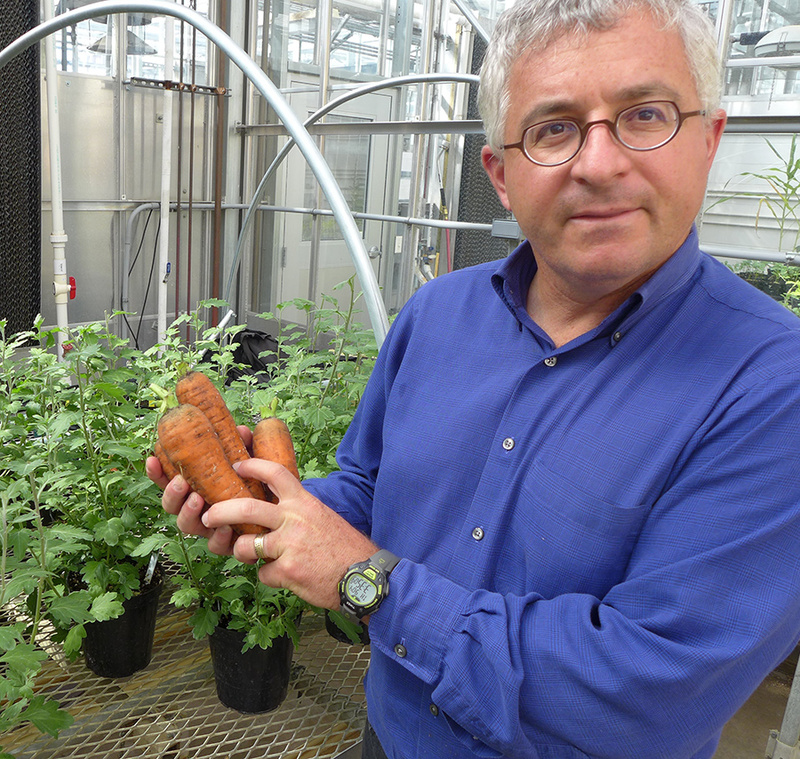 Plant breeder Irwin Goldman displays “sovereign” carrots that he’s given to the Open Source Seed Initiative. People who accept open-source seeds pledge not to acquire patent or other protection when they distribute seeds from their crops — even if they sell those seeds. Goldman is a professor of horticulture at the University of Wisconsin-Madison and a founder of OSSI. 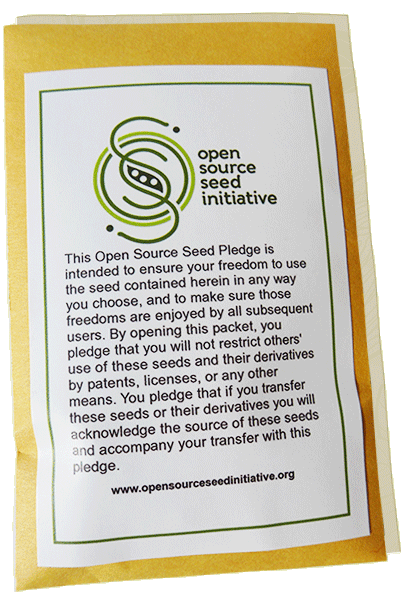 Open-source seeds are covered by this “pledge,” built to parallel agreements on open-source software. Consolidation: Most of the large seed producers are now owned by giant chemical-industry firms, including Dow, DuPont and Monsanto. 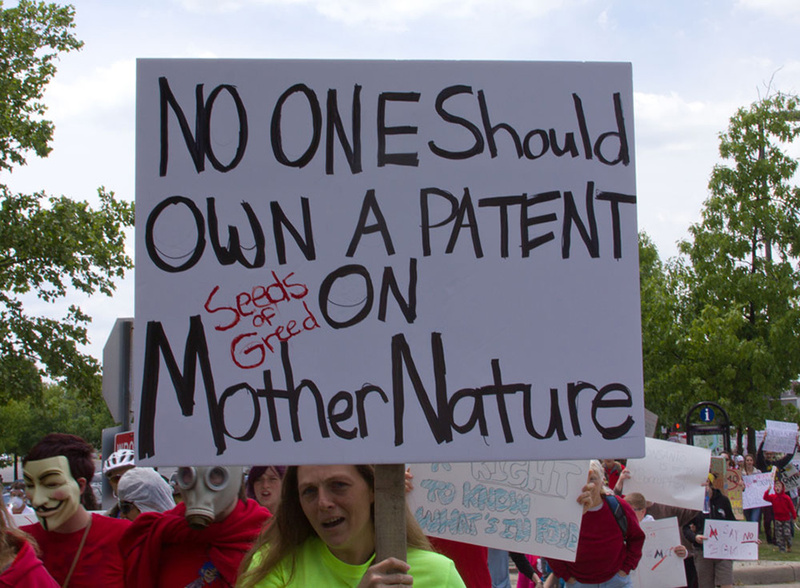 A picket sign says it all; protesters during the March Against Monsanto rally in Columbus, Ohio, in 2013. Increasingly, patents are being granted for vegetables, not just major grain crops, says Kloppenburg. “Monsanto is simply the exemplar of practices that are filtering all the way down” into smaller markets for vegetable seed. 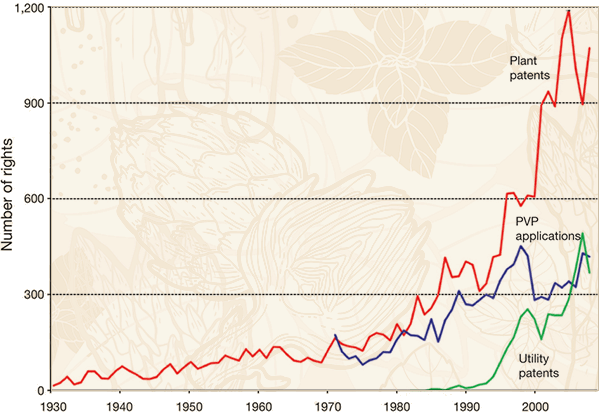 U.S. trends in granted plant and utility patents, and applications filed for plant variety protection (PVP), between 1930 and 2008. Seeds represent tomorrow’s food — and their production is a major industry. Utility patent: The same protection afforded drugs, microprocessors and other inventions, utility patents offer the strongest protection; available since 1980. Moschini, however does not buy that argument. “A patent does not take away from the existing state of knowledge. I cannot assert ownership of something that was already known before I got the patent. It’s true that germplasm has evolved, refined, been bred for many many generations, but when a company patents a particular line,” that does not restrict others from using the pre-existing varieties. While that may apply to utility patents, PVP protects plant varieties that are “uniform, stable, and distinct from all other varieties,” which sounds a lot more expansive to us. Corn productivity per acre has risen six-fold since before World War II, Moschini notes, and although the do-not-replant restrictions imposed by Monsanto and others arose with GM seeds in the 1990s, farmers long ago lost the incentive to replant top strains of maize. Why? Because the most productive corn varieties are grown from plants made by crossing two inbred strains, giving their seeds “hybrid vigor. The next-generation seeds grown from hybrid seeds, however, are far less productive. “If you buy a hybrid, you get a great first-generation harvest, but if you replant … the yield suffers a lot,” Moschini says. 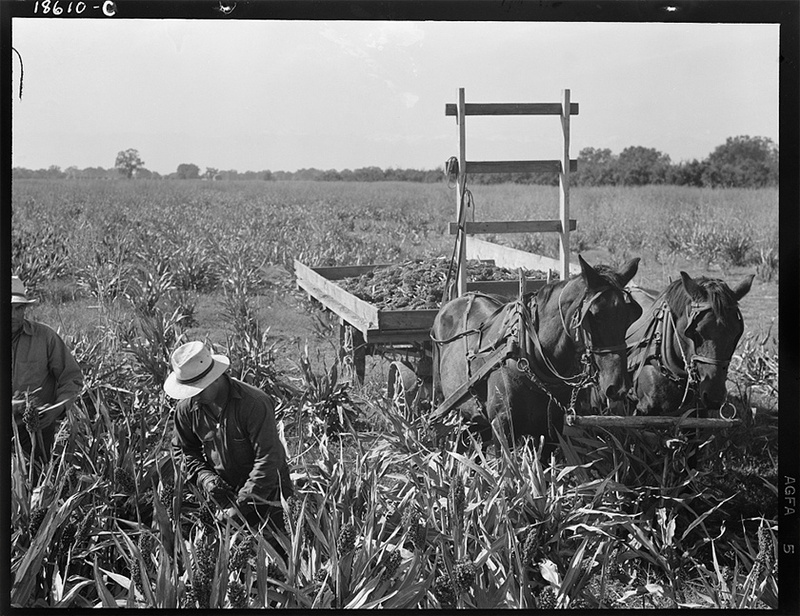 Hand harvesting of milo, a cultivar of maize (corn) in Tulare County, Calif., in 1938. 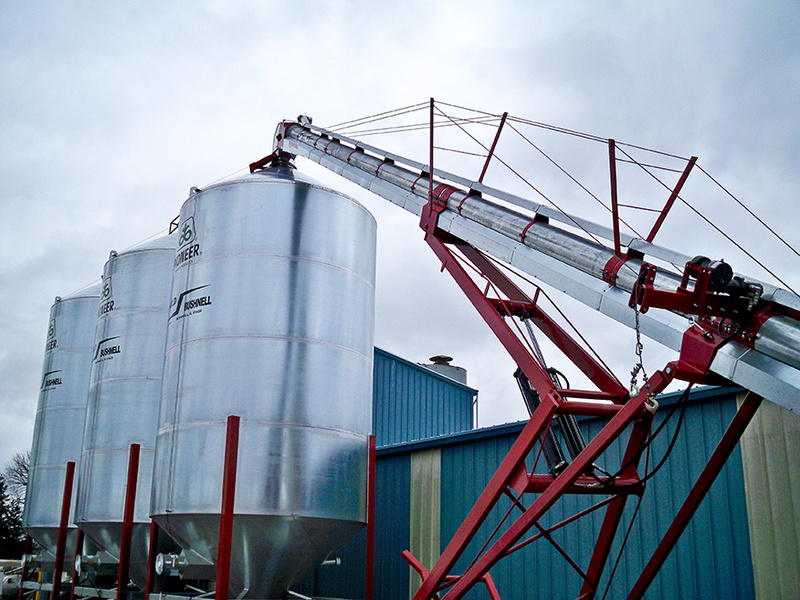 Roll over photo to see a modern John Deere corn harvester in Idaho. To prevent farmers from having to sign a biotech firm’s onerous contract, OSSI would have them sign its own paper, rich with fine print. 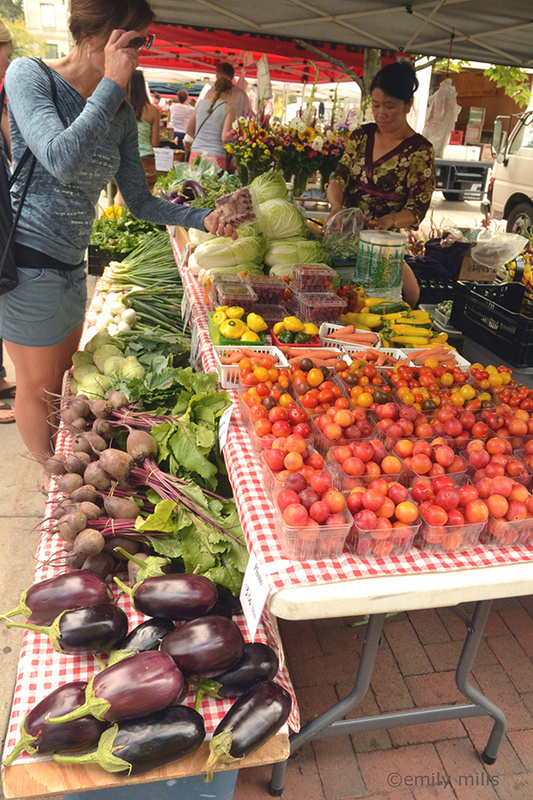 A vendor sells her harvest at Dane County Farmers’ Market, Madison, Wisconsin. Could “open-source” vendors at farmers markets raise awareness about the ownership of seed? Even as productivity of major crops creeps upward, classic plant breeding at universities is on a downslope in favor of plant molecular biology and basic genetics, says Goldman. A founder of OSSI, he breeds carrots, beets and onions at UW-Madison, and has released two carrots through OSSI, but has patented other varieties. Goldman recognizes that all crop seeds can’t be handled as open source. “It’s not remunerative, but if we can carve out some space, that would be really positive. It’s an appeal to moral economics: Let’s have the conversation about seeds, and the social contract” that governs them. 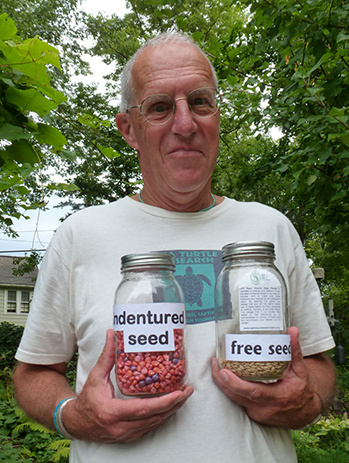 Like OSSI, Seed Savers Exchange is a non-profit organization dedicated to sharing seeds, in this case, of heirloom varieties. 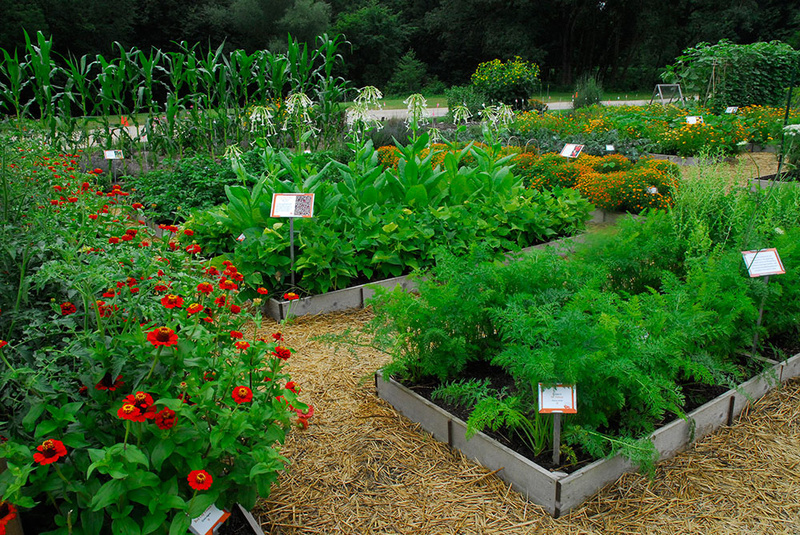 Members have preserved diverse lineages of vegetables and herbs at home, and at exchange’s Heritage Farm in Iowa since 1975. As the world population grows, land is limited, fresh water is getting scarce and the climate is changing. Thus the need for smart plant breeding will only grow, Goldman observes. 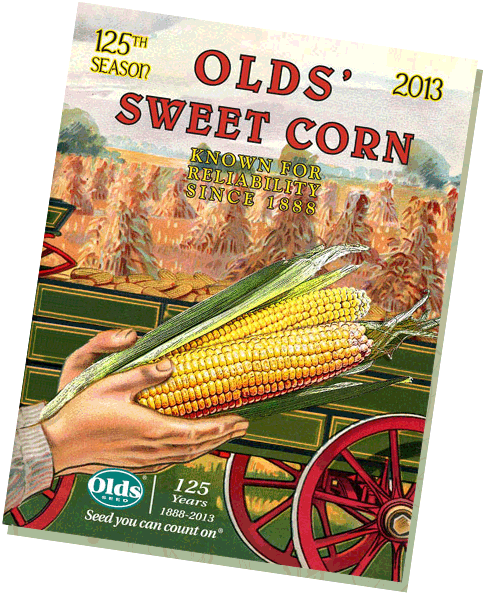 Olds Seeds has been breeding and raising veggie seeds for a long time. 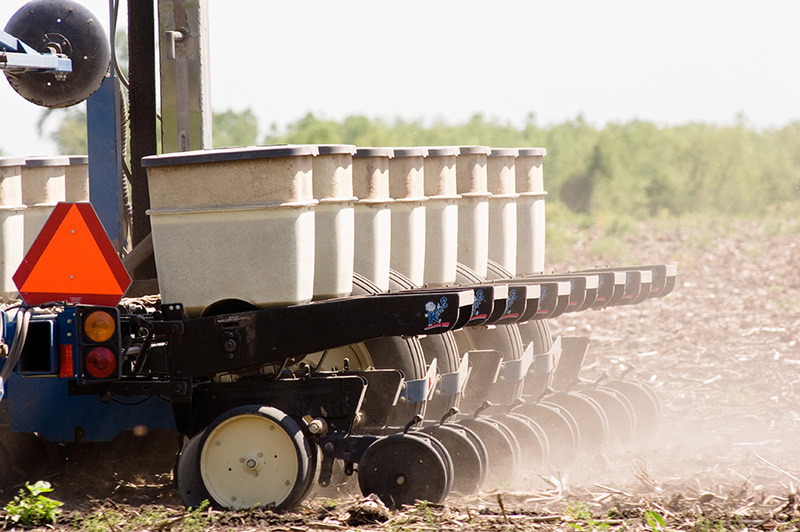 A tractor pulls a soybean planter. Soybeans were planted on a record 85 million acres in the United States in 2014; most were genetically modified and covered by a web of intellectual-property protections. Is that trend moving toward smaller markets for veggie seeds? Although there are some questions about the true profitability of biotech seeds, advocates of small-scale farming are concerned that the same aggressive pursuit of intellectual property protection will extend to the much smaller — and far less lucrative — field of vegetable production. Organic Corn & Soybeans: Competitive?